April 30, 1975 will long be remembered as the day that Saigon fell and with it, the end of U.S. involvement in Vietnam. It also marked the beginning of Vietnam’s unification as a “socialist republic.” North Vietnamese forces began their final attack on Saigon on April 29, with a heavy artillery bombardment. This bombardment at the Tan Son Nhut Airport killed the last two American servicemen that died in Vietnam. By the afternoon of the next day, North Vietnamese troops had occupied the important points within the city and raised their flag over the South Vietnamese presidential palace. 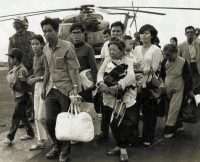 The fall of the city was preceded by the evacuation of almost all the American civilian and military personnel in Saigon, along with tens of thousands of South Vietnamese civilians associated with the southern regime. South Vietnam capitulated shortly thereafter and Saigon was renamed Ho Chi Minh City. Operation Frequent Wind, the helicopter evacuation of Saigon, was the largest such evacuation in history and produced some of the most iconic images of the Vietnam War. John Bennett was the Deputy Director at the Agency for International Development (USAID) mission in 1975. In this excerpt, he recounts the difficulties he experienced leading up to and during the evacuation. For a dramatic account of the evacuation from the U.S. consulate at Can Tho, read Terry McNamara. Read other Moments on Vietnam. BENNETT: We were just playing out the hand. The cards had already been dealt and all we could hope for was a slip by the other side. I was beginning the process of getting my people out of Vietnam, thinning down the ranks, trying to be sure that their effects got shipped. I didn’t know how long I was going to stay until noon of the last day. My wife went at about noon that day. But we weren’t sure that we were all going to leave. [Ambassador Graham] Martin thought that we might make some sort of deal where we could keep a small embassy in Saigon. I didn’t want to make a judgment on this. I would probably have stayed if that had happened. That went with my job: I was the acting AID Director the last three months. We took great care that they had enough money, in dollars. We would put them on buses and take them out to Tan Son Nhut, the airport. Then we found the guards at the gate would steal all their money. So we took the money out separately in an American car. The question is whether or not [Ambassador Martin] should have done it [ordered the evacuation] sooner. If we had done it sooner my personal conviction is that we would have gotten fewer out. We certainly would have gotten different people out. Although, I think more people got out the way we did it, because we had martial law, we could move around the city. We got all of our Americans out and a whole lot of Vietnamese as well. The USIA [U.S. Information Agency] director got heavily criticized for not getting his Vietnamese employees out. That’s what I had spent weeks doing, making sure that each day’s group got out. There wasn’t a hell of a lot else to do. The one thing I didn’t do was burn a whole lot of low-level classified material in the AID building. We somehow never got told when to do it, until it was too late. On Monday afternoon they bombed the airport. I was running a fever and had came home and sat down. I was taking an aspirin and a little libation. The next thing I knew all hell broke loose. Ten minutes of unremitting gunfire. Everybody in the city thought that this was it. My reaction was, hey, they’re in the city and here we go. It turned out not to be the case. The soldiers panicked and were firing in the air. What really worried me was my wife, who was driving back from the airport when the bombing occurred. She had just put some kids who had been left by the American parent, married to a Vietnamese, with Vietnamese relatives. She’d taken them out and put them on an airplane. She was really concerned that they had been killed, but it didn’t happen. The next thing I knew, I got this phone call to come to a meeting at midnight at the embassy. I said I’m not going, I’m sick. Then I thought better of it and so I called up [Ambassador] Martin. I talked to him for an hour about all the things that had happened that day. He was in a reflective mood. He’d called the meeting, but he wasn’t going to be there himself. But by that time I was fired up, so I went. We talked about whom we were going to take out the next day. Then I went home to bed. At about 2:30 a.m. the Vietnamese artillery started shelling the city. You don’t sleep when that’s going on. The next thing I know, at 5:30 in the morning, I get a call from the embassy: “Meeting in the ambassador’s office.” So down I go with my wife and I never went back. I spent that day burning embassy files and trying to round up my AID people. At first not all of them had to go, so I had to identify which ones would and get them picked up. Then we learned all of them had to go. So then I had to contact the rest by telephone and get them picked up. We had a number of small helicopters destroyed by the artillery the night before. They were the kind that could land on roofs, so their loss meant we had to move people around the city in cars and buses. We had a ship, but we couldn’t get to it because North Vietnamese troops were between us and the ship. So that didn’t work out. But we put others on a barge and towed it out to sea with a tug…. It was dark when the choppers finally began to come into the embassy. Because there was so little light and the pilots feared small arms fire, we had to use smaller choppers than originally planned and take off from the roof of the embassy. Fortunately there was little wind, because the pad was small and there was little room for error up there…. There was one crisis after another. I can tell you that at one point I was so tired I didn’t think I was going to make it. But we kept soldiering on. At 8:00 p.m. I was told to go, and so I went upstairs to get on the helicopter. The Marine captain who was in charge was standing there cursing and saying, “Where the hell are all these people? We’re waiting up here and they’re downstairs having a party.” I decided that he might be right and went downstairs. People were milling around, doing nothing. I began telling them to go upstairs and get on the helicopters. Well, I was effective enough that by the time I’d made it to the ground floor there was a line running all the way to the roof. I had to get at the end of it. But I got out at midnight…. It was an eerie sight, flying out. We could see tracers arcing across the ground, and in a couple of places it looked like ammunition dumps were burning and blowing up, a Fourth of July celebration…. I felt I did all right. I got all my people out. That was my responsibility. Nobody was telling me to do it. I just went ahead and did it. I even got four of them over the wall and into the embassy at seven or eight in the evening by pure fluke. I had been working in [Political Counselor] Joe Bennett’s office at the switchboard and saw the light for his number and took the call. They had been waiting for a bus all day at the AID headquarters. I told them if they could get to the embassy in fifteen minutes we could get them in. The embassy was surrounded by crowds of Vietnamese who wanted to get out on the helicopters, so we had to figure out a way to identify them. I told them to take the cover off the embassy phone book and wave it. And we got them over. An American on top had to identify them and lean down and pull them up. A lot of Americans had friends whom they helped get out. These were not officials. If you could get them out to the airport, the planes would take them. This did produce trouble. A friend of mine picked up an ex-minister and took him out to Tan Son Nhut [airport] and dumped him on the street. The Vietnamese police picked him up. The next thing I knew Graham Martin was calling. I had to pick up the Vietnamese after he got out of jail. He was really shaking. He was white. We got him out. There was a lot of freelancing. We had a lot of people coming back in. Mission employees who’d been there in past years, came back to get their friends out. Then we had to get those people out again. There was a lack of control over what was happening…. In thinking back over Saigon’s fall, a whole lot of issues arise…. I discovered that the embassy, and Martin in particular, was strongly criticized for its conduct of the evacuation. Neither Kissinger nor Assistant Secretary Phil Habib had any great love for Martin. They believed that we should have taken far more people out earlier than we did. Perhaps, but they weren’t in Saigon and had no sense of how fragile control of the city was. I always believed we would have gotten fewer people out had we started earlier and order broke down. Even if it hadn’t broken down, the difference would have been in who got out, not how many. I also think that Martin, as tough and nasty as he could be, kept everyone soldiering on in an effort widely thought of as hopeless. It was a remarkable performance, never acknowledged. In fact, somewhere I have a memo from Phil Habib saying that no one in the embassy was going to get any recognition because they didn’t want Martin to get it. Some years later, we turned that around, so that the lower level AID people did get recognition.